This got put on hold while doing “work” knitting, but today I got back to it and actually finished it — hurray! 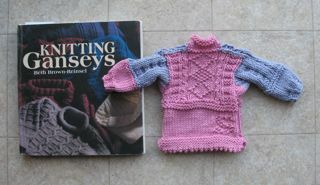 This mini-sweater is the Sampler, from Beth Brown-Reinsel’s book, Knitting Ganseys. It uses all the techniques of a traditional gansey, but on a smaller, quicker scale. Ganseys, also called Guernseys (after the island in the English Channel) and Fisherman’s Sweaters, are native to the coasts of Scotland and England, and are related to the Irish Arans. I used 2 yarns, because I split them between this and my proposal-swatches for the summer Cast On issue. Deadline for those swatches to be received in Ohio is next Monday, 1 December, so I’m glad to have the swatches done and the proposals *mostly* written up. As far as using either Venezia (wool/silk by Cascade) or Touche (cotton/rayon by Berroco) for future ganseys, I now think that I’d rather use a nice, round, bouncy, toothy wool. These yarns both flatten out, the strands separating along the needle as I knit, because they’re so smooth and non-grabby. Ohhh, what a headache I have today! I was just having a nice conversation last night, and *crunch* went my neck. Whatever got stuck (this happens to me often) is pinching some nerve(s) and giving me pain. Perhaps I should move up my next chiropractor appointment. . . . Anyway, I do have some successful knitting to report! Using Wisdom Yarns’ “Skye” bulky wool, I made 2 caps with earflaps for Monday’s toddler shower. Some friends of ours are adopting 2 Haitian orphans and expect to be able to pick them up soon — perhaps as early as next week. One of their grown daughters is hosting the toddler shower. I checked before casting on as to whether the mom-to-be preferred wool or acrylic, and she wanted wool (hurray! ), so I made these. Only took 2 days per cap! For flap placement, I used a rule of thumb from I-don’t-recall-where-I-read-it (I did the math from someone’s cap pattern in a book): front and back are 3:1 and sides are 2:2. In this case, 1 or 2 or 3 groups of 8 stitches each; BO 8, k16, BO24, k16. Again used my own Top-down Square-Top Cap pattern (Ravelry links: child, adult) for the hat crown and sides. I enjoyed making these, and hope the children will be kept warm by them — Flagstaff has got to be MUCH colder than Haiti! I’m also moving forward on my submission for Cast On’s summer issue, but it’s still under wraps. Found an interesting new blog today — actually she has 2: one on wordpress (Shifting Stitches link) and one on blogger (Curious Knitter link), both by Jeny Staiman. And here’s a technique I’ve been trying out with good success lately: a variation on cabling without a cable-needle, by Kathleen Cubley of Knitting Daily. Link to Knitting Daily page with video. Direct link to YouTube. .
KAL = Knit-along; ILL = Inter-library Loan. No, we’re not sick (hurray! Thank you, Lord). The Schoolhouse Press knitalong (link here) has moved from Iceland to the Faroe Islands, and from lace scarf to footlets. I began with a 2-color version, but switched over to solids to be quicker. I have finished the blue footlet, edging it with gray, and began a gray foot to edge with blue (DS’s school colors). I also plan to embroider an owl (mascot) on each toe. His feet are bigger than mine. . . . I love to borrow knitting books! When my libray doesn’t own a particular title, I can place an inter-library loan request for free. If they can find it, and the other library agrees, they get it for me. Recent titles include Hip Knit Hats by Cathy Carron, and Iris Schreier’s Reversible Knits. From the former, I knit this “rose” embellishment (about palm-size). From the latter, I hope to try some cables. Here’s another top-down cap, this time in Wisdom Yarn’s “Skye” bulky and using Judy’s Magic Cast-on. The yarn color-changes even look good inside out! Most of my other knitting has been swatching for submissions to Cast On for next summer. Sometimes this process is exhilarating, sometimes it’s plain frantic. It can be rewarding! Level II of the Master Knitter program prepared me for this quite well, I’m finding. Next is a pair of toddler hats for our friends who are adopting. Oh, and the sweater I designed for my friend Bess to knit for our pastor is done, in time for the cold weather. The yarn is a bit busy, so I only added a little cabling. Simultaneous set-in sleeves — fun! !